What makes a mezzanine gate a mezzanine safety gate? We offer a number of different varieties of gates to provide fall protection on your mezzanines at your pallet access locations, but only some of them are labeled as safety gates. Aren’t they all safety gates? While all our mezzanine pallet gates are designed to protect your personal safety while working on elevated platforms, the gates are designed to meet different standards. Having only a single layer of gates, the self closing pallet gate is not considered a true mezzanine safety gate. 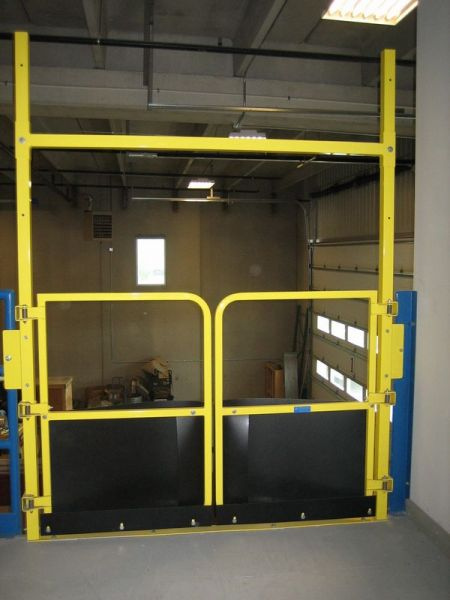 Gates, such as our self closing pallet gate, horizontal sliding mezzanine gate, or vertical sliding mezzanine gate, help keep your employees safe while working on elevated platforms, but are not considered true safety gates. They are all single gate systems designed to meet the federal OSHA safety railing requirements for dimensions and loading. This means that they have a 42” hand rail, a 21” mid-rail, a 4” high toe board, and can hold back 200 lbs. of pressure. Because they are single gated systems, when the gate is open, you have a potential exposed opening on your mezzanine. When using a single gate system, we recommend that you mark out a 6’ bubble around the opening, train your employees to remain behind that line when the gate is open, and post signage reminding them of this at the location. Many of these single gate systems have some additional safety features built into their design. The self closing pallet gate was designed so that instead of needing to open the gate to lift a pallet to the deck, you can lift the pallet up and push it against the bumpers of the closed gate. As you load the pallet the spring loaded doors will open up just enough to fit the pallet, keeping the sides closed off. When you then pull the pallet all the way through from the top, the gate closes itself. The controls for a manual horizontal mezzanine gate are all located behind your existing handrail so your personnel will always be behind OSHA hand rail while opening and closing the gate. Even better, the horizontal mezzanine gate and vertical mezzanine gates are both available in electric operated versions. This allows us to add additional safety features such as strobe warning lights and adjustable timers so the gates will close after a predetermined period of time if your employees forget to shut them. With both control boxes being field wired, you can place them in a location within view of, but away from, the opening. 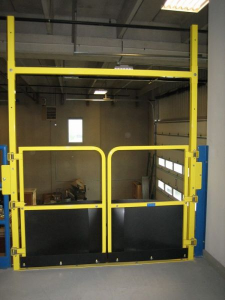 True mezzanine safety gates have both a front and back gate, and are designed to meet the voluntary ANSI MH28.3-2009 standard (Section 6.4.3) in addition to the OSHA safety railing requirements for dimensions and loading. 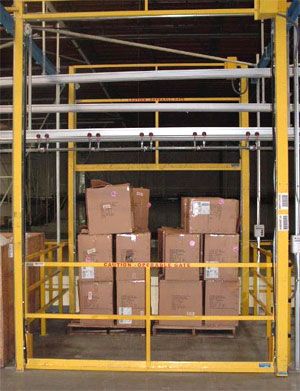 Operating like an airlock, the double gated system allows access to the pallet for the fork truck down below or your personnel above, while keeping a line of guard rail between your employees and the edge of the mezzanine. The pivoting mezzanine safety gate, double drop horizontal mezzanine safety gate and the dual interlocked vertical mezzanine safety gate are all examples of true safety gates. If your facility is following the ANSI standards and wants to put a mezzanine safety gate in a pallet opening, make sure it is a double gated system. This entry was posted in Uncategorized on December 22, 2014 by Derick. Oftentimes, people are looking for an easier way to access their roof. They may have been using an extension ladder before, renting a bucket lift, or even pulling a truck up to the wall and climbing on the vehicle. Adding a permanently fixed roof access ladder is a great way to mitigate the cost of renting lift equipment, or increase the safety of the climber compared to using an extension ladder. Once you’ve installed the permanent access ladder, you need to ensure that you protect yourself from having an “attractive nuisance”, or in other words, an item on your property that can be a magnet to curious kids, while at the same time providing an opportunity to cause them harm. Generally, attractive nuisance laws start with the understanding that kids are not expected to foresee the danger all situations present. As the property owner, if there is reason to believe kids can access your property, you have a responsibility to prevent causes of potential harm. If the owner does not, the property owner could very well be held responsible for the injury to a child. Keep in mind that in many courts, kids are not just young children, but can very well be teenagers also. What are ways to mitigate your liability? The easiest way is to be a responsible property owner. Make sure that you are following the local, state and federal laws and safety standards. Simply do what you can to prevent access to the hazard. Just as you would lock up tanks of propane so they can’t be stolen or so that kids can’t access them, you should do the same with your ladder if it is in an area accessible to kids. A simple lockable door over the rungs of your ladder can help accomplish this. Though it will not stop someone who is determined to gain access to the roof and is willing to ‘spiderman’ up the side, or pull their car up and climb up, it will help lessen your exposure to inquisitive kids, as well as add a deterrent to opportunistic thieves and vandals. Another option, if you have the room, is to fence in the area surrounding the ladder (this also works well at the bottom of stairs accessing roofs). Again, if someone is determined to partake in criminal activities they will find a way to do circumvent whatever you do, but with regards to having an “attractive nuisance” you will have helped alleviate the opportunity for accidents. This entry was posted in ladders on December 5, 2014 by Brett.